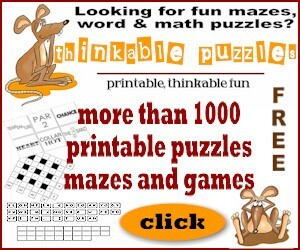 ThinkablePuzzles.com offers hours of fun and challenging word and math puzzles for kids AND adults. These are perfect for teachers, home schoolers, parents and great for shower games! They offer word and number searche, wuzzles (a mixture of words and puzzles), mazes, number blocks, word changes, cryptograms, mad gabs and much more. The problem of boys in education is not a new one – data has been mounting for many years that our sons are simply falling behind our daughters, says pioneering veteran in education, Edmond J. Dixon, Ph.D. But it’s not because boys are any less intelligent than girls, he adds. A recent study from researchers at the University of Georgia, which followed 10,000 students as they moved from kindergarten to eighth grade, indicates that though boys scored well on tests, indicating mastery of material, girls got better grades. Researchers account for higher scores in girls because they comported themselves better than boys while in the classroom. Dixon, a cognitive-kinesthetics specialist, discusses why his first three “secrets” are so important in helping boys with active minds and bodies. • Movement matters: Nearly ever time, the student who disrupts class because they cannot sit still is a boy. Research reveals that young boys’ brains develop a tremendous amount of neural wiring to facilitate movement and sensitivity for how things “fit” together. When a boy is a toddler, we would never think that a sedentary child is a good indicator of health, so what makes us think that he should change while in grade school? One tip: Allow a boy to use his “movement wiring” by allowing him to use his body as he learns to represent the topic. • Games work: Their testosterone makes males are naturally competitive. If you want them to become suddenly engaged in something, make a game out of the lesson—it’s just like flipping a switch on. Just look at sports talk shows with analysis such as “Pardon the Interruption;” each expert has a clock clicking down to make his point. Little gaming tricks like this works on the male brain. Tip: create clear rules – they help boys understand victory, and they add legitimacy to the lesson. Games also serve as an excellent method for male bonding, too. • Make them laugh: Observe a group of males; whether young our old, they bust each other’s chops. Not only is it okay, they enjoy it! Everyone has a positive chemical reaction with laughter; boys, however, often use humor as a form of communication, an asset with which most girls do not have a problem. Research has demonstrated that boys’ emotions are processed initially in the more primitive parts of the brain and come more indirectly to the speech centers. That’s why making a crude joke is easier for males to communicate sensitive feelings. Tip: Before starting homework or an assignment, ask a boy to consider what might be funny, weird or strange about it; his mind will be more focused on the topic afterwards. “This is just the tip of the iceberg; if parents and teachers are serious about getting their boys off to a better start in life, I encourage active participation and education,” Dixon says. A pioneer in the field of cognitive-kinesthetics for learning, Edmond J. Dixon, Ph.D., is a human development specialist with more than 30 years of experience as a teacher, administrator, writer, researcher – and parent of boys. He is the founder of the KEEN Differentiated Learning Group, an organization dedicated to helping struggling learners, and the creator of KEEN 5X, a series of strategies for classroom engagement and learning that were have been used with more than 50,000 students and teachers. His previous books, “KEEN For Learning” and “Literacy Through Drama,” have been used by educators to improve classroom learning. 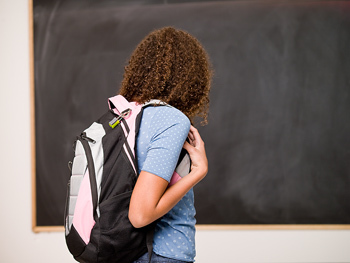 A dynamic and popular presenter, he has spoken throughout North America on education and human development topics. .
Click here to learn more about National School Backpack Awareness Day. To interview Karen Jacobs or another occupational therapy practitioner who specializes in ergonomics, contact AOTA Media Relations Manager Katie Riley at 301-652-6611, ext. 2963, or kriley@aota.org. Founded in 1917, the American Occupational Therapy Association (AOTA) represents the professional interests and concerns of more than 140,000 occupational therapists, assistants, and students nationwide. The Association educates the public and advances the profession of occupational therapy by providing resources, setting standards including accreditations, and serving as an advocate to improve health care. Based in Bethesda, Md., AOTA’s major programs and activities are directed toward promoting the professional development of its members and assuring consumer access to quality services so patients can maximize their individual potential. For more information, go to www.aota.org.